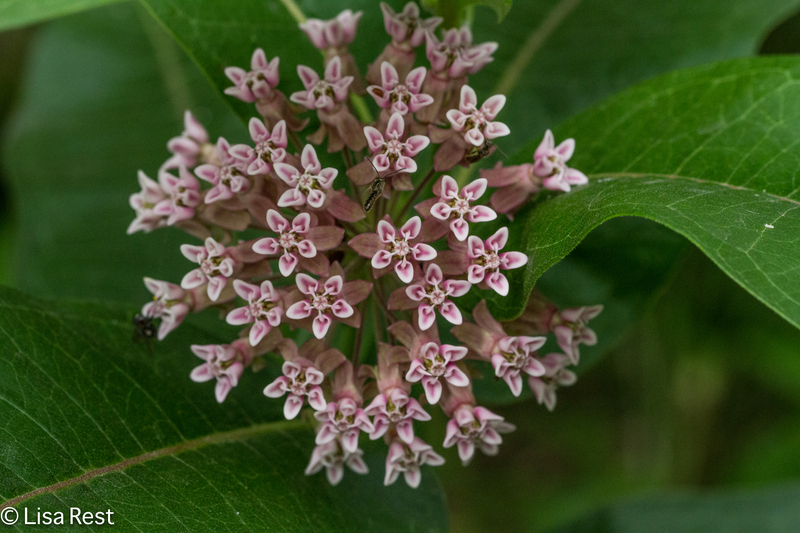 The one bloom on the Swamp Milkweed was visited by a Monarch Butterfly last Saturday. 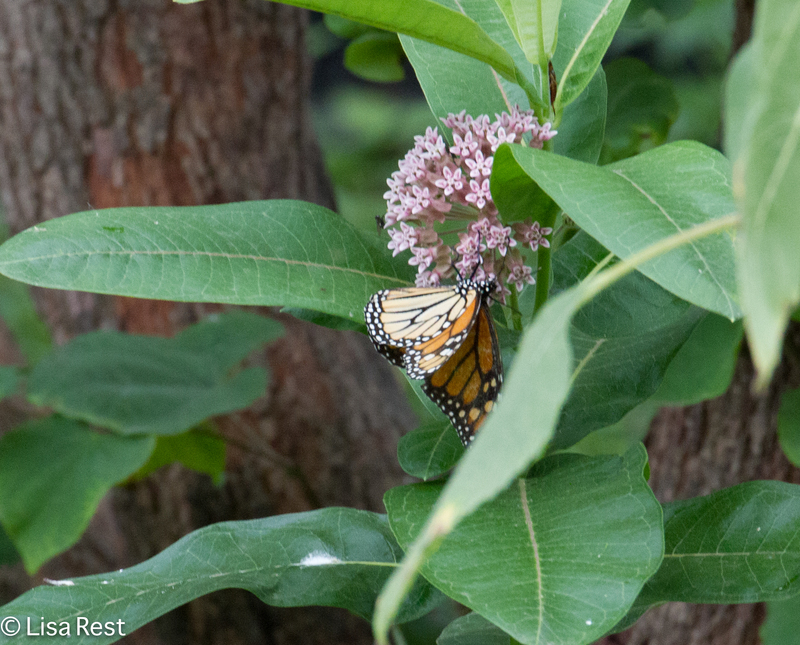 I saw the Monarch again yesterday but it did not stay, only flying over the entire yard and right past me a few times, I suppose because the one milkweed blossom is spent and there was little else of interest. Next year, I promise, will be different. 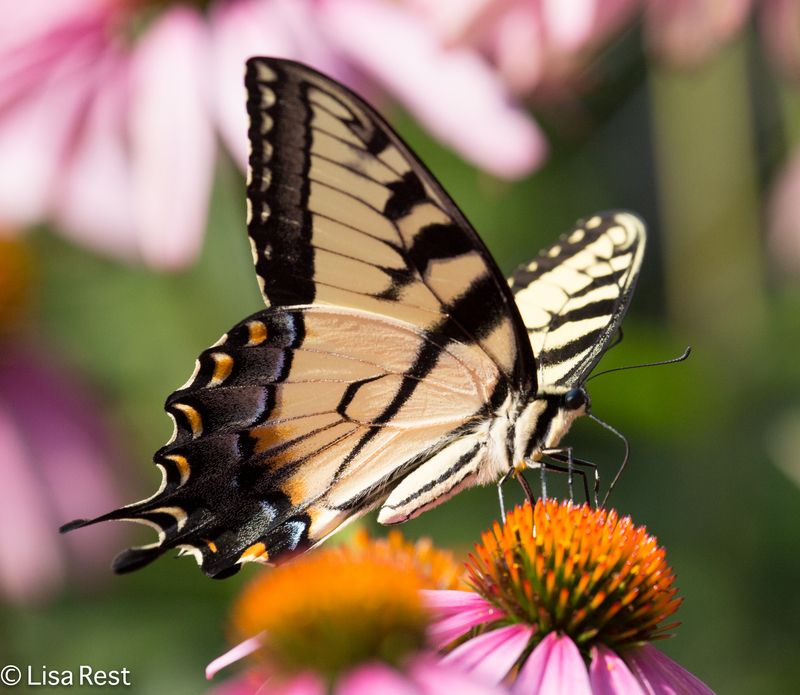 There were two Eastern Tiger Swallowtails in the purple coneflowers last Saturday. They wouldn’t pose together but this one was available. 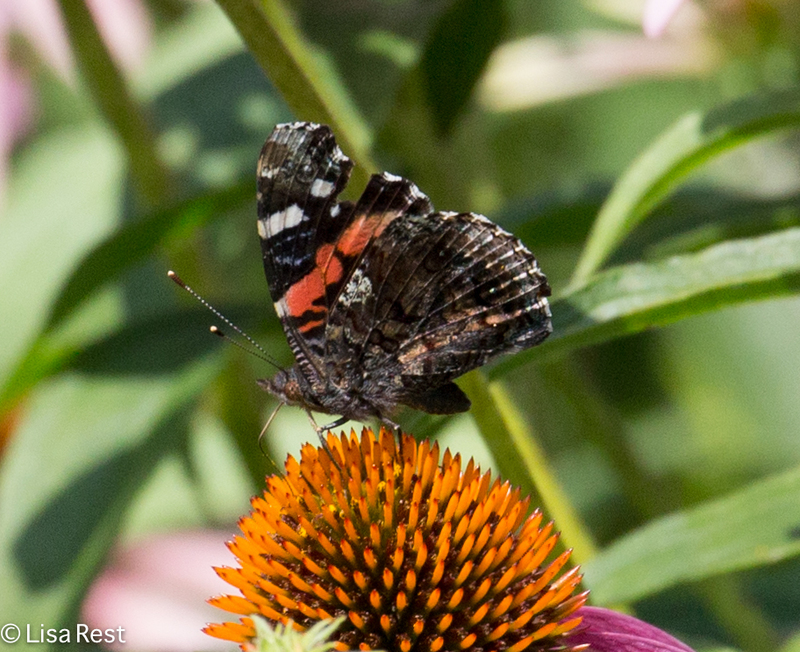 And yesterday I finally managed to get a Red Admiral to cooperate. 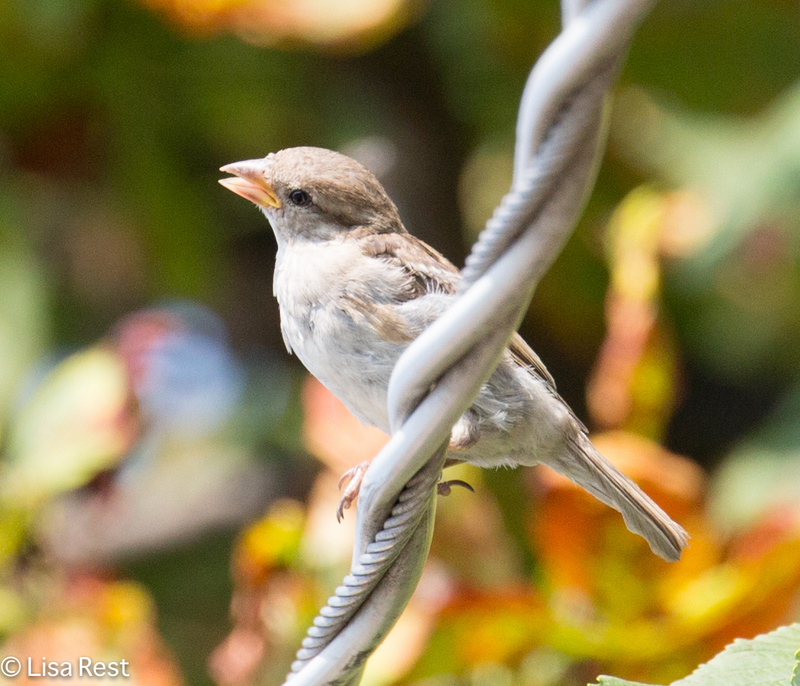 Young birds are now in the yard in droves. Last Saturday, they were still begging a lot. 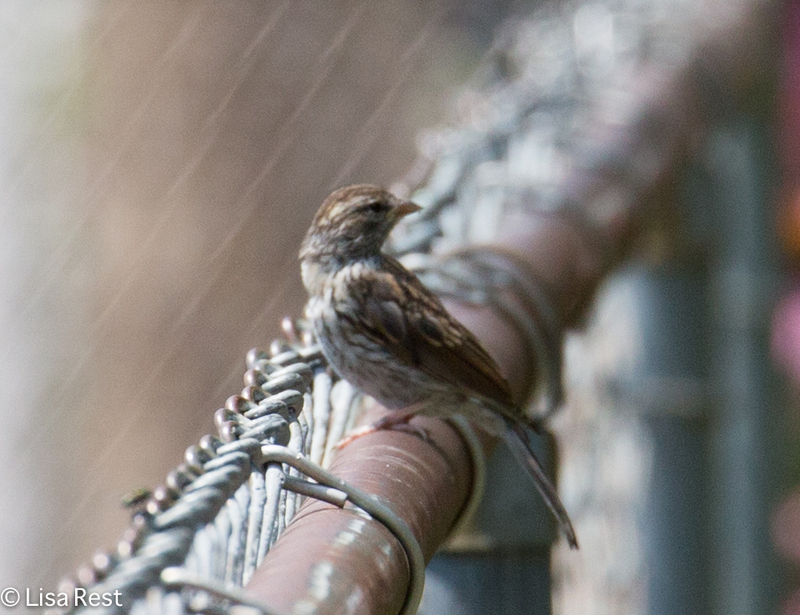 Last Saturday I had the windows open and heard Chipping Sparrows in the yard. 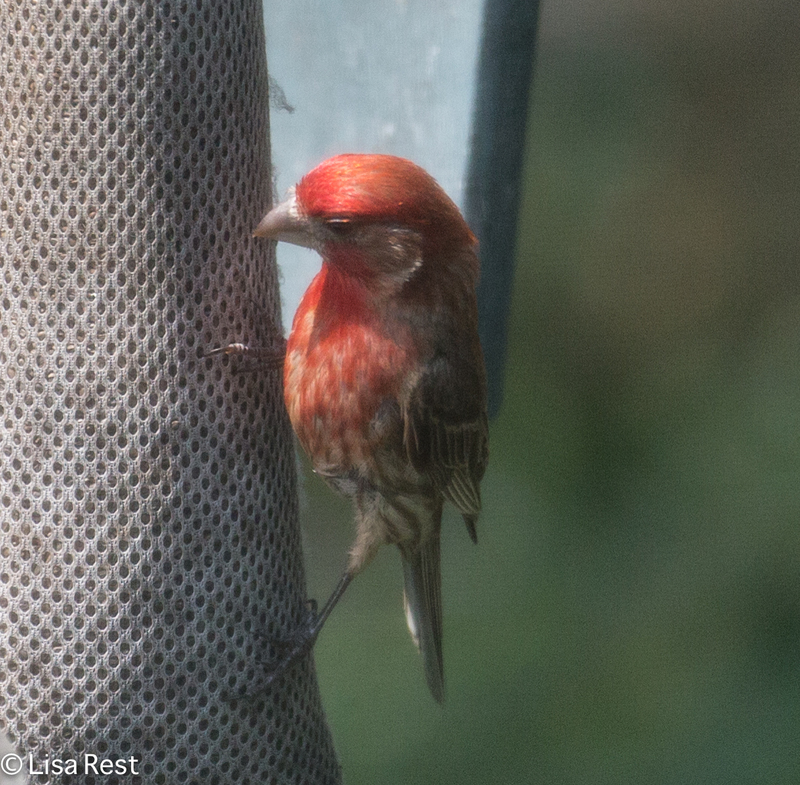 I could not photograph them outside, as they were right by the back door and I would have scared them away, but I managed to get a few pictures through the kitchen window. 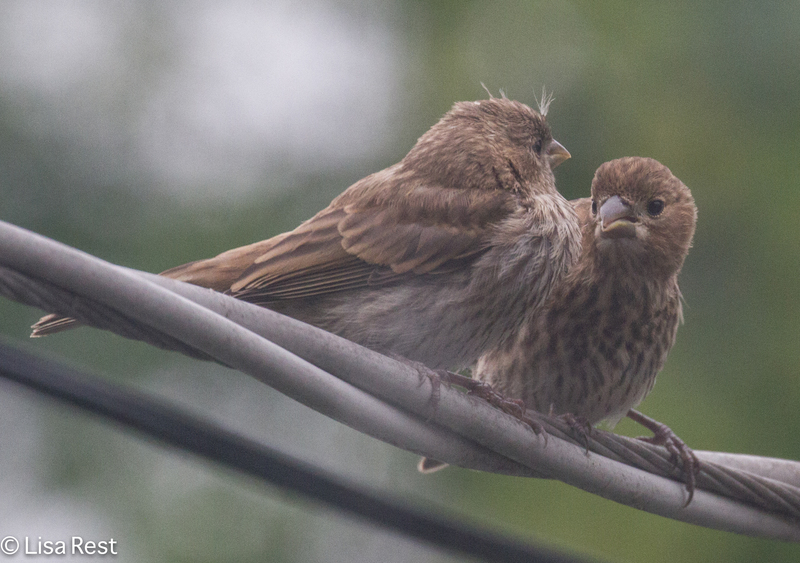 I suspect there is more than one pair breeding in south Berwyn. 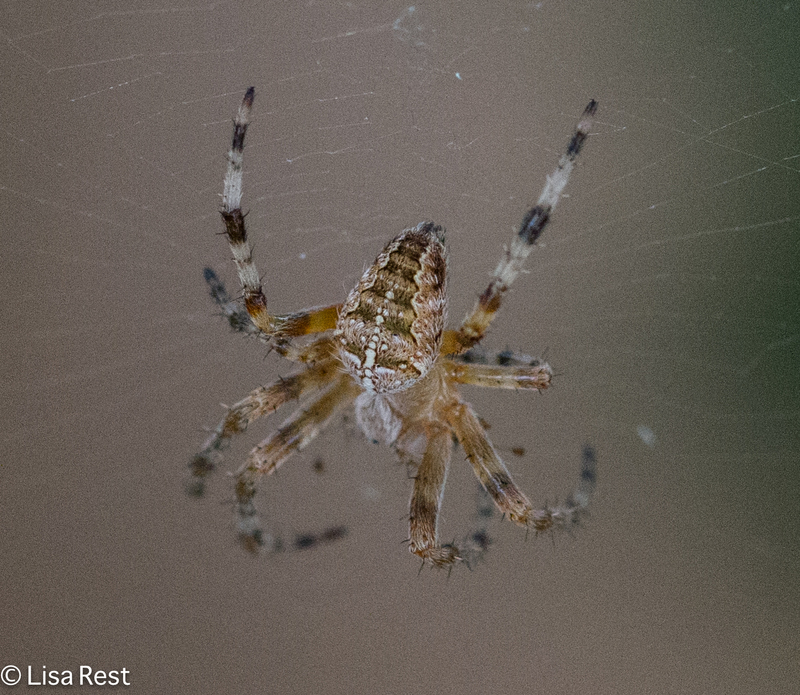 I discovered this spider last weekend in a shady spot. 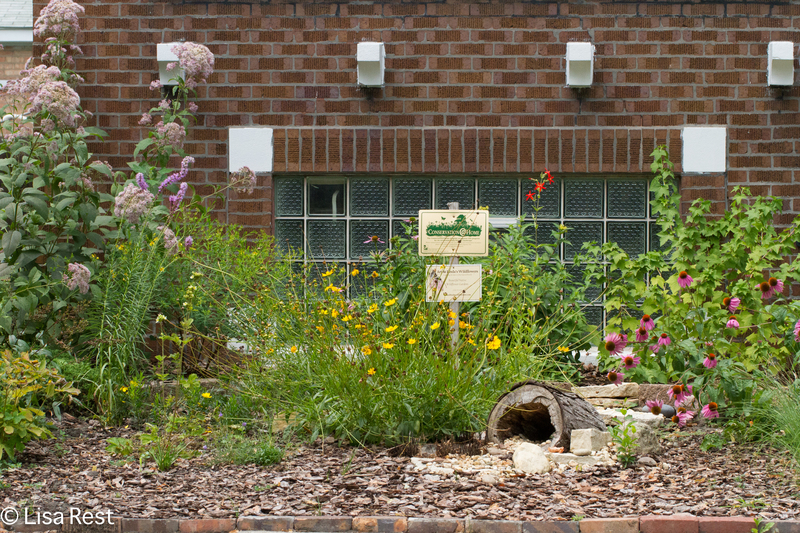 The front yard is more established this year, one year after its planting. This is the main section, the other smaller portion being on the other side of the front walk. 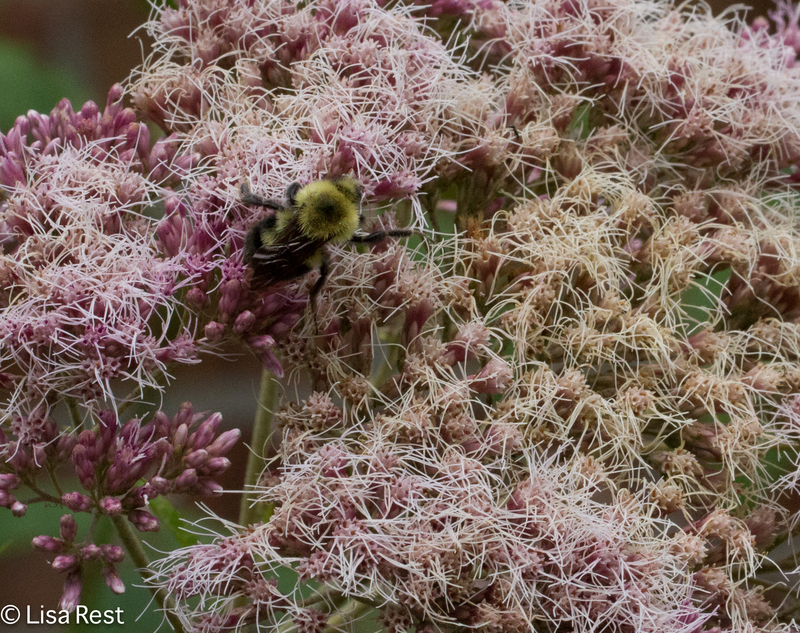 I have seen butterflies now and again but the biggest hit lately was the Sweet Joe-Pye Weed: the bees were literally bathing in it. But this weekend it’s looking rather spent and frazzled. I watered it last night and am hoping we get some rain. 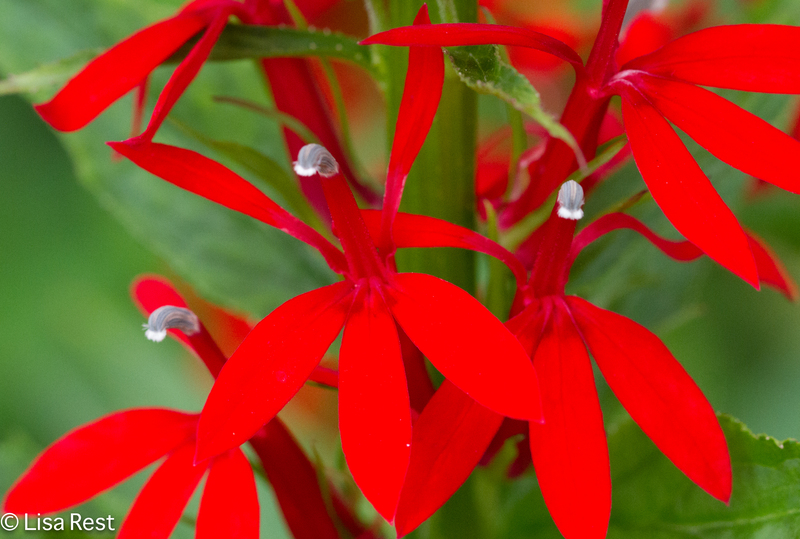 I seem to have two types of cardinal flower. The first photograph is from the ones that have been in the backyard for years, and the second from the new one in the front. Below is a plant that mystifies me. I have no idea where it came from but it planted itself between two bricks. I don’t recall if it flowered last year but this year it has done a nice job. 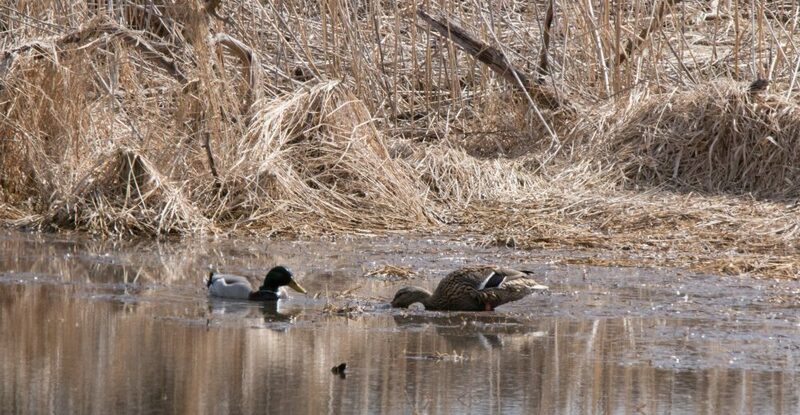 Even if it is an invasive, it doesn’t appear to be spreading. It’s in one shady spot under the hawthorn. If anybody knows what this is, please let me know. 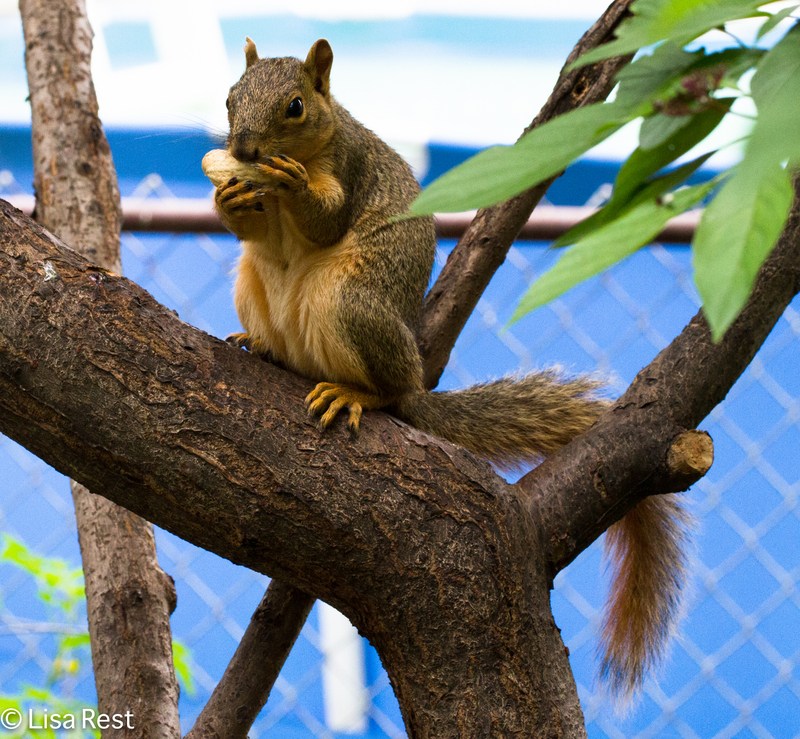 I thought there was something a bit different about this fox squirrel. For sure, it’s a she. The one I am used to seeing all the time has been a male. She is a bit shy, but every bit as polite as he is. Invariably dill comes up here and there in the yard. I thought I planted some this year but it didn’t come up where I put it. 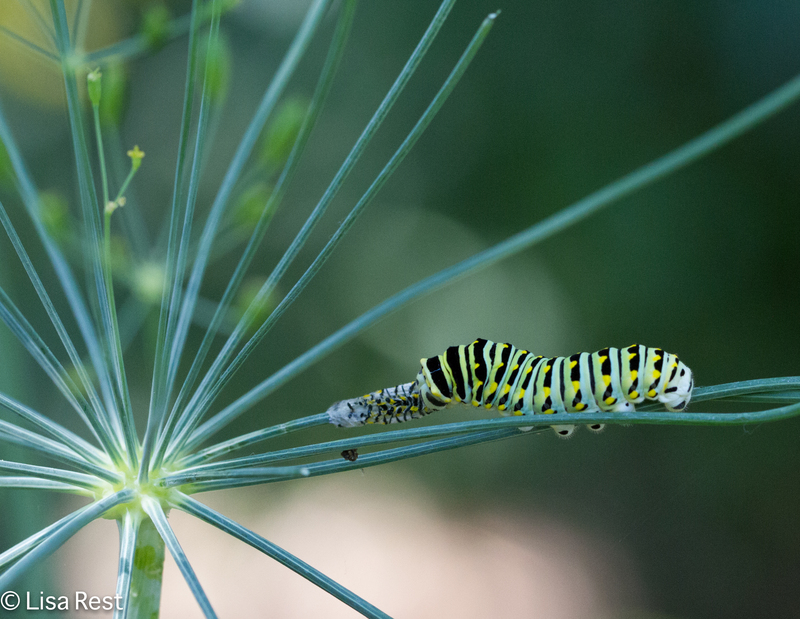 Nevertheless a few plants have managed to grow and I leave them hoping they will attract female Eastern Black Swallowtail Butterflies to lay eggs. I was very happy to see this caterpillar yesterday. 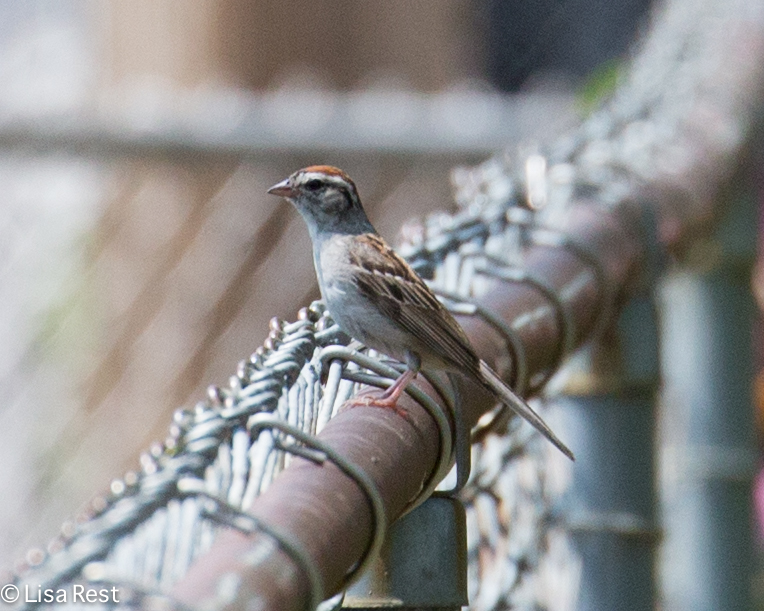 It’s been a few years since I’ve seen one of these in the yard. I’m going to plant more dill for next year too. 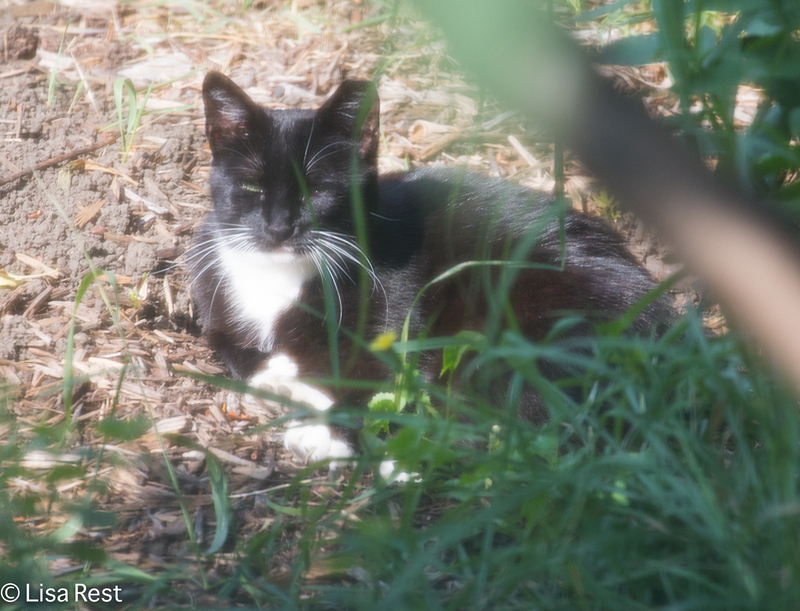 I did manage to work in the yard even though it was nearly midday: it wasn’t buggy and my trees keep me cool. At any rate, it’s looking a little tamer I suppose because we haven’t had too much rain lately so the weeds actually stay pulled for a while. I think I will start photographing and cataloguing all the weeds before I yank them out next weekend, in part because I see them often enough elsewhere, and in the process of looking them up I will learn about others. I know a lot of them by sight but have forgotten some of their names. 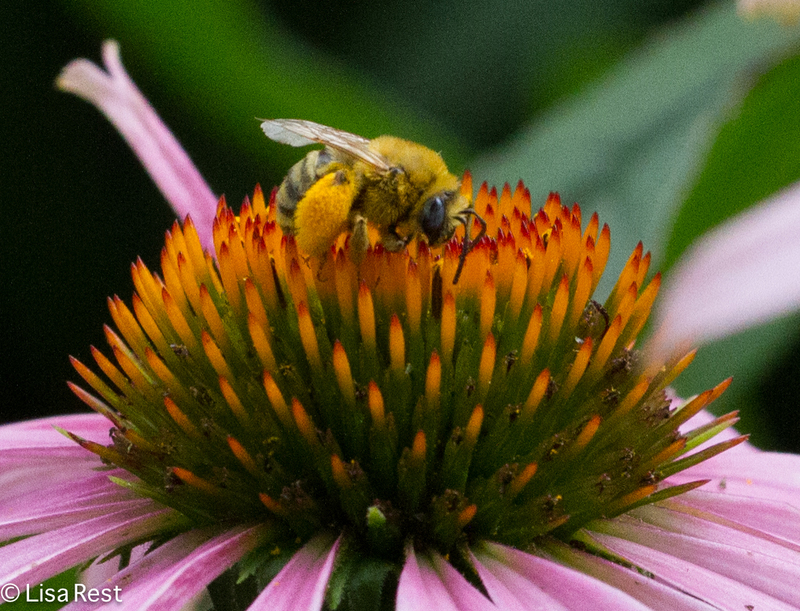 The macro lens is making a nerd out of me. 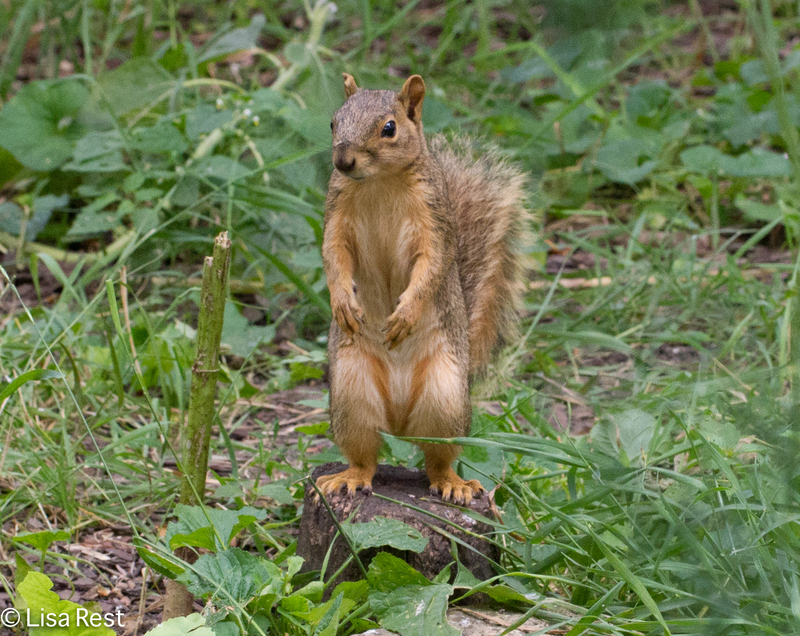 I will be back later with a few photos from my weekend excursion. 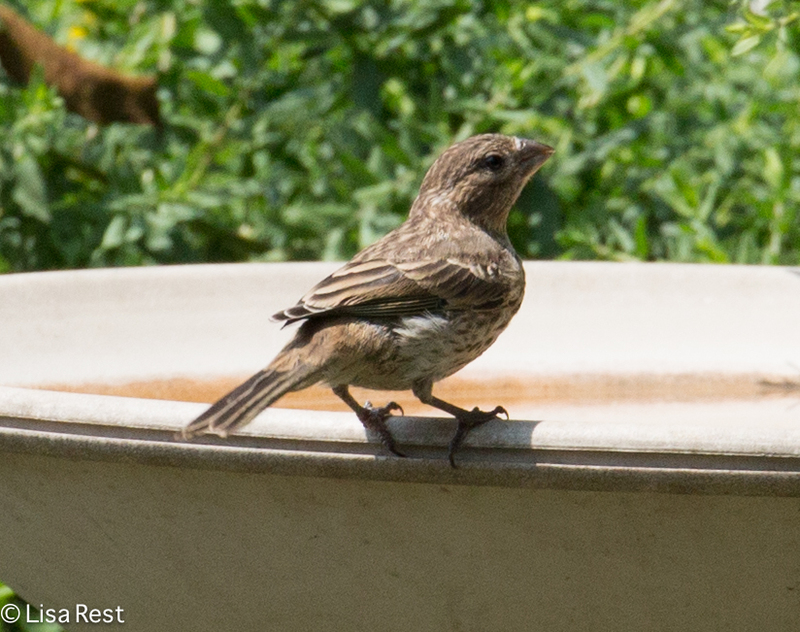 This entry was posted in birds, butterflies, Fledglings, House Finch, photography, Sparrows, Squirrels, wildflowers and tagged bees, Cardinal Flower, Chipping Sparrow, dill, Eastern Black Tiger Swallowtail, Eastern Tiger Swallowtail, feral cat, fox squirrel, Garden Spider, House Sparrow, Monarch Butterfly, Purple Coneflower, Red Admiral, Swamp Milkweed, Sweet Joe-Pye Weed, weeds by Lisa Rest. Bookmark the permalink. Great pictures as usual. 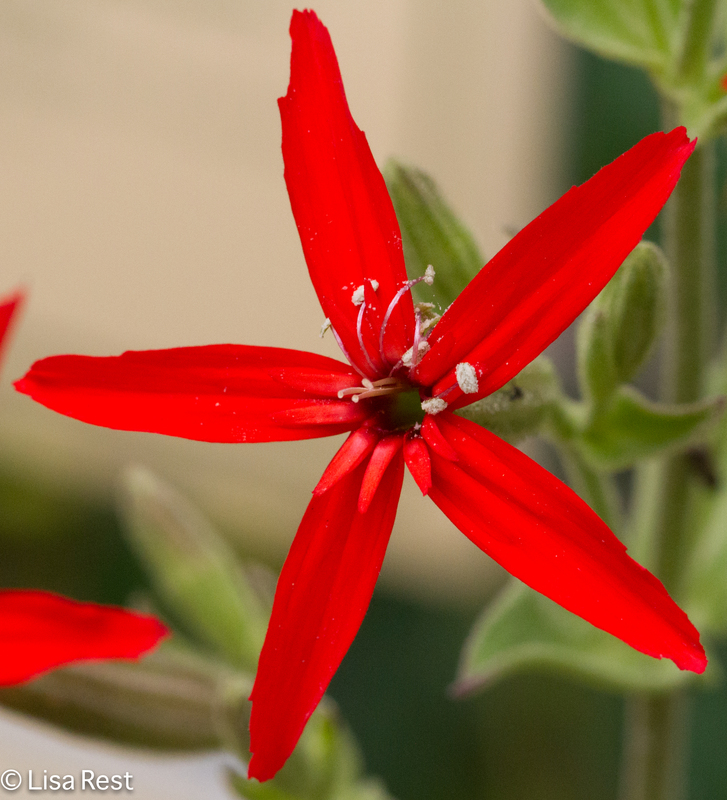 The cardinal flower is an odd one, the top looks normal but I’m not sure what’s going on with the other. 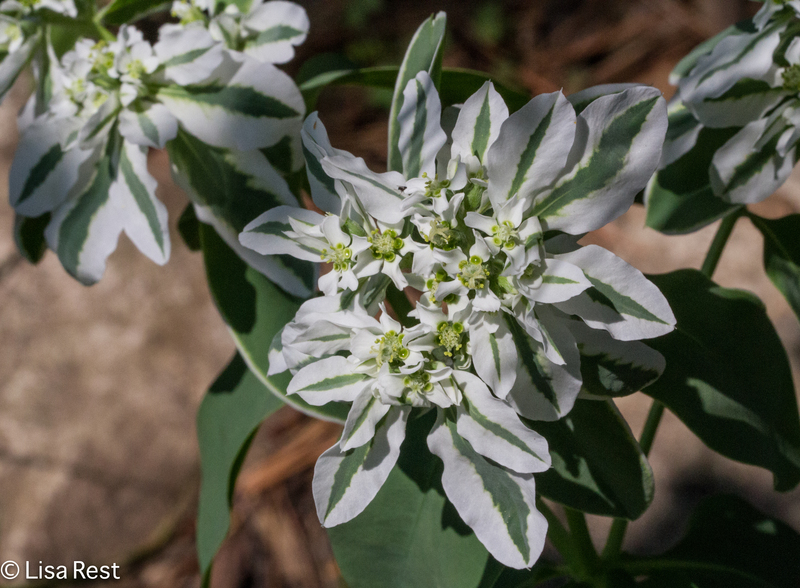 Your mystery plant is euphorbia marginata, snow on the mountain. I have some here too and it’s a mild mannered selfseeder for me. I like it! Look at that, I never even suspected it was a native plant! I can imagine how cool it would be to come across a mass planting, it’s very showy. Don’t worry about following my blog, I’ve always enjoyed yours and keep up with it because I learn so much…. plus the awesome pictures, thanks! Thanks, Frank. Although after I first search produced the native information for the euphorbia marginata, then when I started looking later for planting options it seems there are two varieties, the annual and a perennial “dwarf” species, which makes me wonder if the latter is a cultivar. Whatever, I don’t care, it’s pretty and it’s staying where it’s happy. As for following your blog, don’t worry about me worrying about following you because I am a very itinerant follower, but I will try to keep up every now and then. Thanks so much for your praise, I’ll try to live up to it! 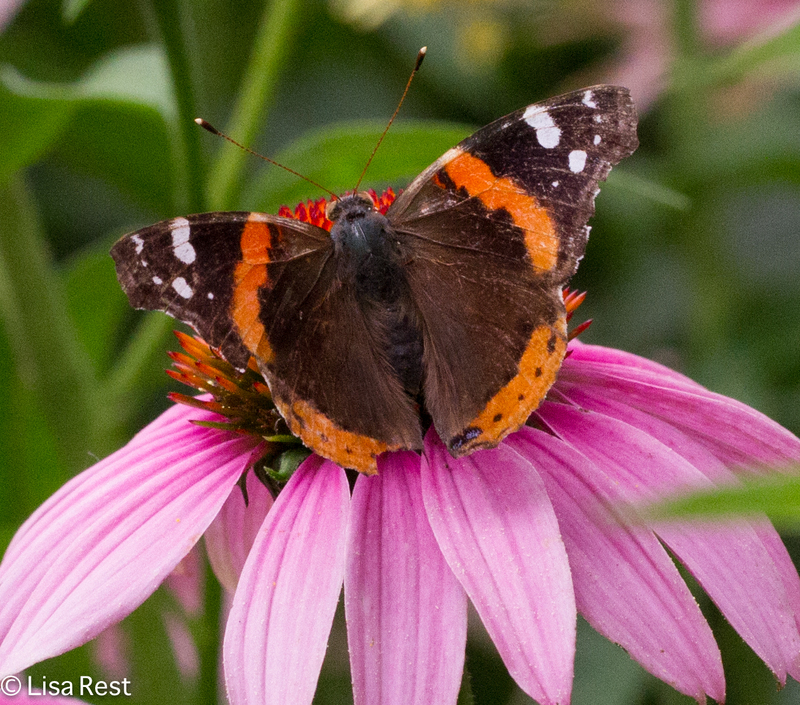 Love your post..I so enjoy the little things that nature has to offer..excellent..
Lisa, These are truly marvelous. P.S. You donât have to know the name to be captivated by the beauty. Thank you again.